The former Doctor Who companion's latest film is a vampire caper. So does she have a taste for blood? Hi, Freema. You're in a film that's about vampires (1). Have you ever donated blood? I did at university - like a million years ago. But I'm thinking of doing it again, because my sister's husband got one of those kits you can get to test your own blood type. He found out he was 0-negative. And out of seven people who got tested, I got 0-negative as well (2). That's the universal blood type, so we can give blood to anyone. You were in the UK version of Law & Order. Which do you prefer - law or order? They go very well together, don't they? The thing I learned from that show was that the law is really quite difficult. My sister has a law degree. I just remember the books and books and books she came home with to study. She came with me when I went to visit the Old Bailey and sit in on trials as part of my research. It was like a whole alien world. Sorry, why were you using home blood analysis kits? It was something to do with all of this DNA family history stuff. I'm totally fascinated with heritage. There was a minute when I was talking to Who Do You Think You Are, and some of the . stuff they found out in the first round was really interesting. Would you be up for having the blood of a teenager transfused into you? There are apparently big anti-ageing benefits. Well, fascinatingly, my new film, it looks at the issues that vampires are discussing, and it goes into social media, and how we value ourselves in this world of Instagram and selfies. Which cosmetic procedure would you most be up for? Nothing! I'm practising yoga and meditation, and it's doing wonders for one's perception of oneself. I'm in a bit of a hippy-dippy phase. It's not something I look down on, though. Everyone is entitled to do what they feel. What style of yoga are you doing? It's a combination of ashtanga and vinyasa. And lots of meditation. What poses are you good at? Do you know the Crow? Is it like the Eagle but a bit uglier? No! I'm overjoyed that we have Jodie Whittaker. Not a moment too soon, really. She's perfect casting, and it's definitely the right time. Who else would be good in the role? Well, is it true that Bradley Walsh is going to be the new assistant? (4) I think he will be brilliant at that. In tribute to Bruce Forsyth, would you like to play "Maximum-Sentencing Play Your Cards Right"? I'll give you the maximum sentence in British law, and I want you to tell me whether you think it should be higher or lower. I thought we were supposed to be talking about my vampire film, Gavin! Violent disorder: five years. Too high or too low? Having played a lawyer, I know I would want to know a lot about the background. I couldn't just give you an answer if I haven't even seen the mens rea (5 . That's only fair. Recently, you've been working on Netflix's Sense8 with Lilly and Lana Wachowski. What's your favourite sense? Given how I'm a complete foodie, I'll go with taste. What did you take from working with the Wachowskis? They were my heroes for many years. Ever since The Matrix, which changed my life in so many ways. They made me think - about philosophy, about business. They say never work with your heroes, but they are so fantastically erudite and so interested in other people that it's empowering. They're unique, honest and brave artists. We need to be taking something from very encounter we have in life and learning and growing. Your half hour is up, I'm afraid. Anything else we need to put on the record? Yes, I'd also like to put in a mention for Epilepsy Action. It has a National Doodle Day on 22 September. My seven-year-old niece was diagnosed at the beginning of this year. Sometimes these things have to be brought to your awareness. Eat Locals will have its UK premiere at FrightFest on 26 August, and is released on VOD from 1 September. Footnotes 1) Eat Locals, directed by Jason Flemyng from Lock, Stock & Two Smoking Barrels. 2) 12% of Brits are 0-negative; 36% 0-positive. Only 2% are B-negative. 3) Agyeman played Martha Jones, the companion for 10th Doctor, David Tennant, for two series of Doctor Who. 4) It is. 5) "The intention or knowledge of wrongdoing that constitutes part of a crime, as opposed to the action or conduct of the accused." Given that these are maximum sentences, we should surely assume malign intent. APA 6th ed. : Haynes, Gavin (2017-08-25). 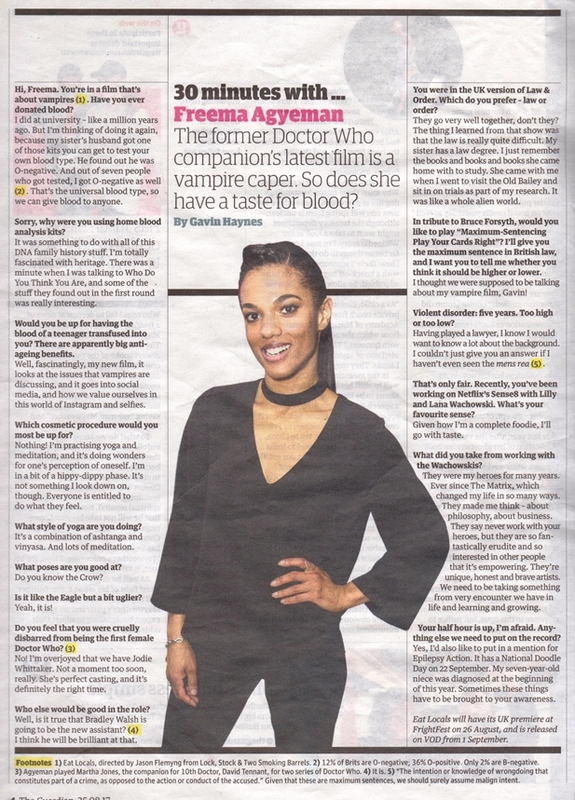 30 minutes with ... Freema Agyeman. The Guardian p. G2, p. 4. MLA 7th ed. : Haynes, Gavin. "30 minutes with ... Freema Agyeman." The Guardian [add city] 2017-08-25, G2, p. 4. Print. Turabian: Haynes, Gavin. "30 minutes with ... Freema Agyeman." The Guardian, 2017-08-25, section, G2, p. 4 edition. This page was last modified on 18 March 2019, at 00:35.